Corey Vol 2. was recorded at the same time as Corey Vol. 1 by Duma Love, former percussionist, beatboxer, rapper of Cibo Matto. Corey Vol. 2 is more experimental in nature and could be considered a “B Side” CD. Some highlights include: Jersey Boy – A 5 minute beatbox and rap track. I Miss You – An Experimental R&B track. Sacrifice Yourself – A heavy Rock track. Seven Frequencies – A beautiful Classical Guitar track. This Love – An Acoustic Ballad. You'll think you're listening to a full band when in reality it's Duma Love and Producer J. Shepherd playing all the instruments. To ensure the success of this unique release, Intolerance Records has implemented a full scale campaign including television and radio spots, major and college radio play, an elite Internet marketing strategy and a well established grass roots street team. 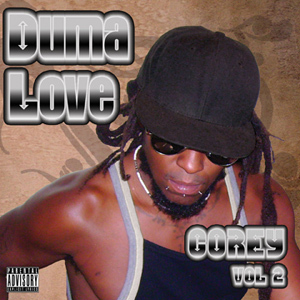 In addition to electronic downloads at all major online retailers, Corey Vol 2. is also available in physical CD format and distributed at brick and mortar retail outlets. Check out Corey Vol. 1 for more Mainstream Hip Hop. ©2010 Intolerance Records, a division of JShep. - All Rights Reserved.